Herbal remedies have been used for centuries to treat various inflammatory conditions. Recent research has discovered many mechanisms of action for the herbs contained in this formula. that work together synergistically to slow the body's production of eicosanoids. These are a family of powerful hormone-like compounds produced in our bodies from Essential Fatty Acids. Along with an anti-inflammatory diet, these natural herbs can help to regulate the immune system for more normalized function, a crucial step in terms of life management. If you have never heard of curcumin, the pigment that gives this herb its yellow-orange color, it's one that should be on your healthy radar. Turmeric Root has been used in Ayurvedic and Traditional Chinese Medicine (TCM) for a number of conditions and may be one of nature's most powerful potential healers. Scientists believe the reason is that Turmeric contains curcumin which has been shown to help fight infections, treat digestive problems and some cancers, as well as inflammation in the body. The herbal extract of Turmeric root has also been shown to reduce pain, inflammation, and stiffness related to rheumatoid arthritis (RA), bursitis, and osteoarthritis (OA). It has been suggested in preliminary studies that curcuminoids in Turmeric extracts promote a more normal inflammatory response by inhibiting the expression of COX-2 "pain" enzyme. Some participants of the studies who took a concentrated form of this herbal tincture have shown a 50-58% reduction in pain and stiffness, along with significantly reduced swelling and inflammation, and actually physical function and mobility. And, unlike ibuprofen or aspirin, Turmeric root's curcumin reduces inflammation naturally, without damaging the kidneys or liver. Boswellia serrata, also known as boswellin or Indian frankincense, contains specific anti-inflammatory properties referred to as boswellic acids that have been shown to significantly reduce inflammation. Studies have shown that with continuous use Boswellia can assist in sustaining stable blood flow to the joints and improve flexibility and strength. This also makes it a convenient herb for those who suffer from gout, to help lessen the pain brought on my the condition. Ginger root is a herbal remedy that has been shown to not only boost the immune system but also to have fantastic anti-inflammatory and pain-relieving effects. The antioxidants in Ginger root and rhizome have been shown to suppress cellular production of nitric oxide, a compound that produces toxic free radicals that promote tissue damage and inflammation. For this reason, it has been a recommended herbal remedy to reduce osteoarthritis pain and joint inflammation. Some say it works even better than OTC and prescriptions they've tried. Ingredients: Turmeric Root, Boswellia, Ginger Root, Structured Water and 20% Alcohol. Non-Alcohol: Turmeric Root, Boswellia, Ginger Root, Structured Water and Vegetable Glycerin. 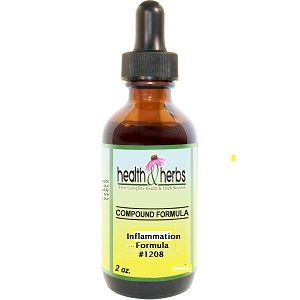 Contraindications: See single herb extracts/tinctures for contraindications and side-effects.